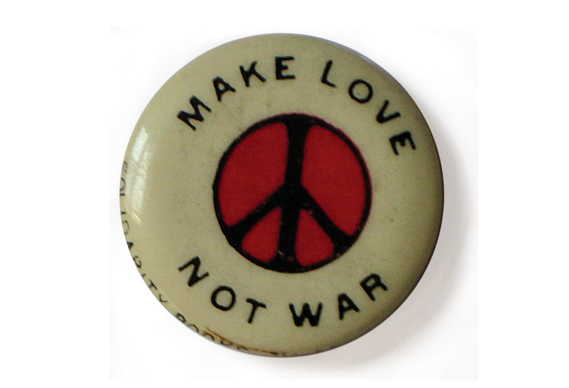 1967 provides the pivot point in my personal mapping of the 20th century – June 1st if I want to narrow it down to a specific date. This was when ‘Sgt. Pepper’s Lonely Hearts Club Band’ by The Beatles was released, an album that would soundtrack the psychedelic ‘Summer Of Love’, blowing minds and inspiring countless other artists to up their game, whilst The Beatles’ interest in lysergic acid diethylamide and eastern mysticism altered not only their own states of consciousness and perception, but, pied piper like, they led a whole generation down the rabbit hole. However, you won’t find any of the tracks on ‘Sgt. Pepper’s’ in the compilation I’ve put together in tribute to this momental year – the reason being that none of its inclusions were issued as singles. I’d originally thought about approaching this as a selection of my favourite tracks from the year, but whilst I was researching I decided that I’d only feature singles that had made the top 50 of the UK chart during 1967, and in the order in which they appeared. This has resulted in a 6 hour epic, available to stream via Mixcloud. Whilst, of course, being a subjective selection, I felt that this format would provide a reflective representation of what people were listening to in the UK that year. It meant that I missed out on some tracks that were hits in the US, but not here, not least the Jefferson Airplane’s ‘White Rabbit’ and Buffalo Springfield’s ‘For What It’s Worth’, both key US countercultural anthems, plus Soul classics including Jackie Wilson’s ‘(Your Love Keeps Lifting Me) Higher And Higher’ (which would be a UK hit thrice over, but in ’69, ’75 and ’87) James Brown’s Funk blueprint ‘Cold Sweat’ and Smokey Robinson & The Miracles’ ‘Tears Of A Clown’, hidden away as an album track in ’67, but destined to become a transatlantic #1 hit 3 years on. Then there’s a whole heap of now Northern Soul classics that were complete obscurities at the time of their release, only to be excavated in the ’70s by obsessive British DJs. Despite these much loved omissions, the criteria that I’d fixed on provides the best possible balance between my own personal perspective and the perspective of the British record buyers back then. Having listed all the possibilities, I tried to narrow the selection down to 100 titles, but ended up unable to cull below 124. The decision to keep them in order of appearance hadn’t occurred to me until I wrote them all down – the chronological sequence enabling a deeper insight into how the year gradually unfolded. If I were to give a full overview of 1967 it would include the middle-of-the-road artists that the older generation were buying in big numbers. Engelbert Humperdinck, an Indian-born balladeer from Leicester, would come out of nowhere to claim 3 of the year’s best-selling singles. Then there was Welsh singer Tom Jones and a supporting cast of easy-listening adult entertainers including Petula Clark, Anita Harris, Vince Hill, Frankie Vaughan, Harry Seacombe, Des O’Connor and Val Doonican. This wasn’t the type of music that interested the younger generation, but the leftovers of a previous era. It was Tom Jones who held the top spot as 1967 begun, his single, ‘The Green Green Grass Of Home’ a fascinatingly morbid tale of a prisoner dreaming he’s free, only to wake to find the hangman’s noose awaits him. It was hardly a harbinger of the flower power days ahead. 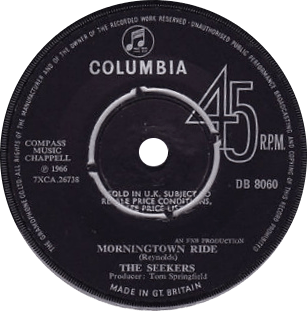 It was the record at number 2 that week that I chose to open the compilation, ‘Morningtown Ride’ by the Australian Folk / Pop group, The Seekers, who hooked-up with British songwriter / producer Tom Springfield (brother of Dusty), to score a whole stack of big hits between ’65-’67. In researching this, I was surprised to see ‘Morningtown Ride’ in the chart as late as ’67. I’d first got to know the song at Joytime, a children’s sing-a-long and talent show, held on the bandstand of a local park, that my sister would take me along to during the summer months – its dream journey theme strongly resonating with me, and I presume with the other little people in attendance. I’ve since realized that the track originally appeared on a 1964 album, the later hit single version being a re-recording, which tallied with why I’d thought I was few years younger when I’d first heard it. Now it presents itself, ‘Morningtown Ride’ is the perfect opening track – for whilst having that nostalgic ring to set you back in the past, it reflects the wide-eyed child-like wonder that would exemplify the year in so many ways. It must be remembered that when The Beatles set about the recording of their ‘concept album’ it was childhood that initially provided its underpinning. The first 2 songs completed were McCartney’s ‘Penny Lane’ and the Lennon’s ‘Strawberry Fields Forever’, but, with the album still some months off EMI were keen to get new product into the shops, the upshot being that these 2 tracks appeared back-to-back on arguably the greatest double a-side ever released. In those days The Beatles didn’t include their singles on albums, so the concept album was conceptualized without the presence of these 2 great sides. Instead a loose circus / show theme evolved instead, the group re-framing themselves as ‘Sgt. Pepper’s Lonely Hearts Club Band’ complete with a cover that exploded in summer of love technicolor, courtesy of English Pop artist Peter Blake. It’s no exaggeration to say that everything would change after ‘Pepper’s’. But that was later. 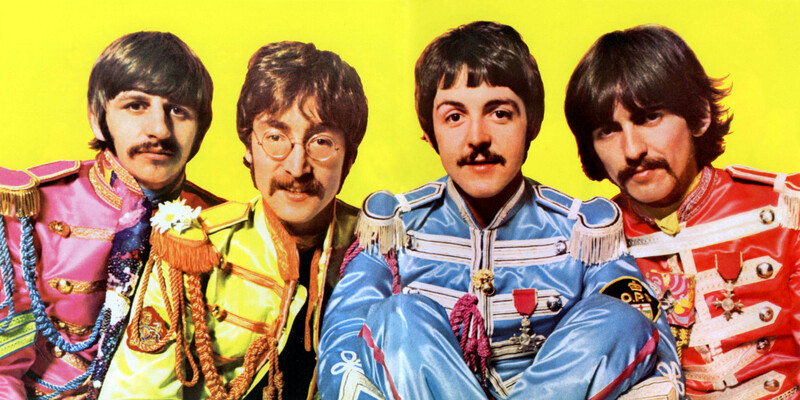 In February, their previous 11 singles having topped the UK chart, The Beatles released ‘Penny Lane’ / ‘Strawberry Fields Forever’, only to see it held off the summit by the aforementioned Mr Humperdinck with his dirge to married strife (at a time divorce was still very much frowned upon), ‘Release Me’. This caused a number of commentators to suggest that The Beatles were entering a downward slide in their career – their new album was taking months to make, perhaps they’d hit a creative block and lost their muse? Furthermore they’d all sprouted strange moustaches, and that short film they’d put together for ‘Strawberry Fields’ was a little weird, wasn’t it? Whatever had happened to those loveable mop tops of but a few years previous? It was the lull before the perfect storm – little did they know what sorcery was afoot in the Abbey Road sound laboratory. I was 6 going on 7 as 1967 began. 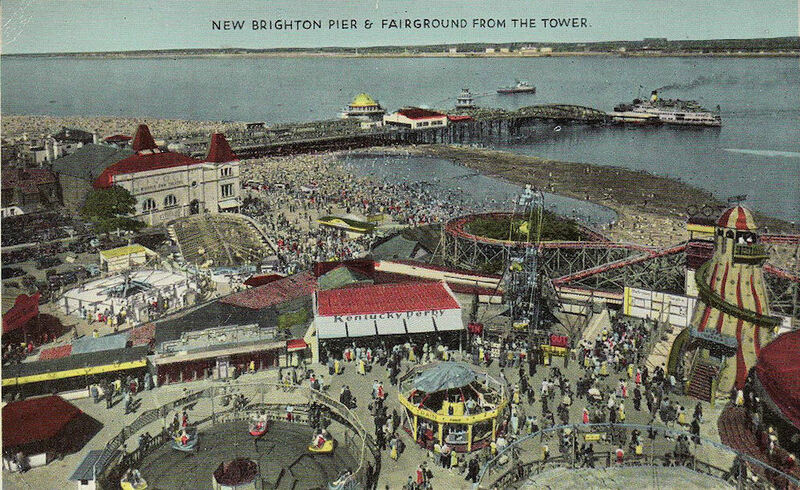 I grew up in a seaside town with fairground rides, buckets and spades, toffee apples and donkeys. My family had taken over a pub in 1966, which also housed function rooms catering mainly for weddings and 21st birthday parties. 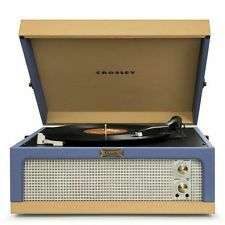 All of a sudden I was hearing music not only outside my home, but within it, via jukeboxes and mobile discos. I also benefitted greatly from having a teenage brother and sister, who were doing what teenagers did back then – buying singles, or what American’s called 45s. My good fortune was that the singles they brought into my earshot were by these wonderful Soul artists – Otis Redding, The Four Tops, Sam & Dave, The Supremes, The Temptations, Wilson Pickett, Marvin Gaye, Stevie Wonder etc etc. Soul music emerged as a commercial force in the UK during the mid-60s, having been championed by the Mods, and its no surprise that by 1967 the Tamla Motown label, set-up to release the records that were rolling off Berry Gordy’s Detroit Motortown production line, had really hit its stride. At origin, in the US, these records were issued on a variety of labels including Tamla, Soul, Gordy, VIP and Motown, but in the UK they all came under the Tamla Motown umbrella from 1965 onwards, and the cultural significance of this legendary British institution cannot be understated. As I’ve said elsewhere, Tamla Motown was the original discotheque music. 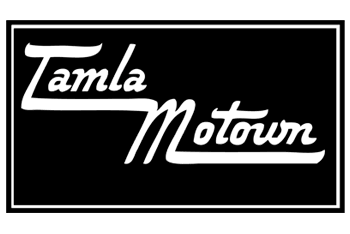 There are no less than 24 Tamla Motown singles included, which makes it, by some distance, the most popular label in the selection. Atlantic and Stax were Soul’s other main label sources, but, apart from these US offerings, there are also 2 British recordings in the listing. 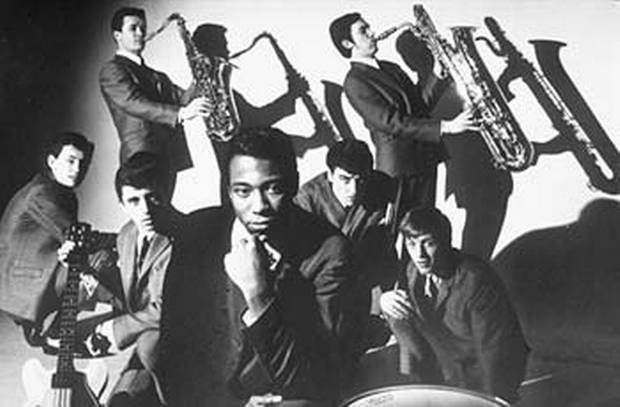 The Foundations, were the first multi-racial group to top the chart, the members being West Indian, British and Sri Lankan, then there was Geno Washington & The Ram Jam Band, a show-stopping live force, Washington having originally come to the UK as a US serviceman – they’d have 2 top 10 albums in 1967, with their single, ‘Michael’, included here. In 1980 Washington received due tribute on Dexy’s Midnight Runners #1, ‘Geno’. The music of a small Caribbean island, Jamaica, had also begun to make major inroads this year, with hits by Prince Buster, The Skatalites, Desmond Dekker & The Aces and The Ethiopians – there was even a British take on things via The Pyramids’ ‘Last Train To Rainbow City’, recorded by UK based Afro-Caribbean musicians and providing Guyana-born writer / producer Eddy Grant, with his first hit – Grant would go on to find success with The Equals in the coming years, before gaining big popularity as a solo artist between the late ’70s and late ’80s (The Pyramids would sort of reverse their name to Symarip, who are best-known for 1969’s ‘Skinhead Moonstomp’). Despite the fact that none of these records featured a British vocalist, the inclusion of Geno Washington & The Ram Jam Band, The Foundations and The Pyramids very much illustrates the origins of British black music. There is however a black British singer featured, the Welsh chanteuse Shirley Bassey, although her records reflected the world of showbuisness rather than Soul, her 1967 hit ‘Big Spender’ taken from the then Broadway musical ‘Sweet Charity’. Whilst Soul was a mainstay of 1967, the year’s defining movement was towards the psychedelic, San Francisco’s Haight-Ashbury district its epicentre. 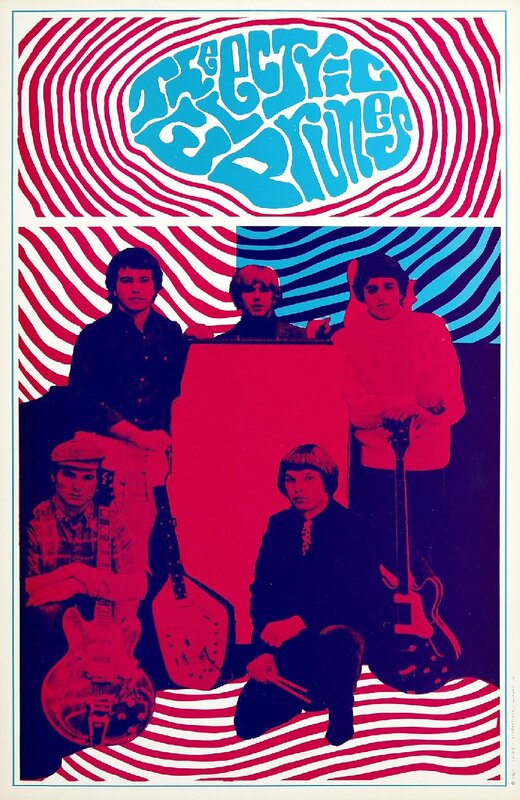 Thoughout ’67, artists like Jimi Hendrix, The Electric Prunes, The Pink Floyd, Traffic and The Doors would all make their presence felt on the UK charts. The Beatles were at the vanguard and, even without ‘Sgt. Pepper’s’ they totted up the biggest amount of inclusions here – 7 in all. They’d end the year with ‘Hello Goodbye’ at the peak position of the chart, with the group’s ‘Magical Mystery Tour’ double-EP right behind it at #2. I decided to go for a happy medium and feature half of the 6 tracks that made up the EP (in the US ‘Magical Mystery Tour’ was released as an album, cobbled together with the their other singles and b-sides from ’67). The next highest amount of places was 6 from Tamla Motown group The Four Tops, led by Levi Stubbs, one of the great Soul vocalists of the era. In October ’66 their single ‘Reach Out I’ll Be There’ had rocketed to the top of the UK chart, the first Tamla Motown #1 (lablemates The Supremes had reached top spot in 1964 with ‘Baby Love’, but on the Stateside label). It wouldn’t be until the start of February ’67 that the record finally slipped out of the top 50. 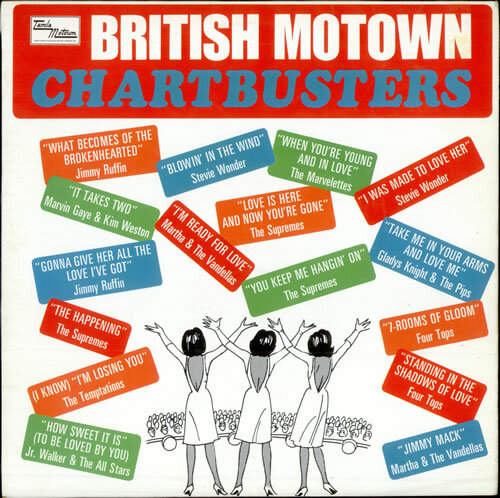 Whilst Motown’s success had been ever-growing in the previous years, ‘Reach Out I’ll Be There’ blew the doors wide open, not only for The Four Tops, but for other Tamla Motown records – 1967 providing a bumper crop of UK hits, with the hugely popular Motown Chartbusters album series launched in October ’67. The Supremes have 5 inclusions. Their first 3 hits of ’67, as with all their previous releases, were credited to The Supremes, but from the release of ‘Reflections’ onward lead singer Diana Ross’ name would be moved to the fore in terms of billing, whilst original member Florence Ballard was replaced by Cindy Birdsong. The group would be then known as Diana Ross & The Supremes until Ross left at the end of 1969 to go solo. The Supremes would then continue with a new lead singer, Jean Terrell, scoring a handful of top 10 UK hits between 1970-72. Otis Redding , who also has 5 placings, reigned supreme as the King of Soul in ’67. Headlining the Stax / Volt tour of Europe before wowing the hippie crowd at California’s Monterey Pop Festival, the pre-curser for Woodstock 2 years later – the recording world was truly his oyster. Following Monterey, like many musicians at the time, he immersed himself in the newly released ‘Sgt. Peppers Lonely Hearts Club Band’, inspiring a new song ‘(Sittin’ On) The Dock Of The Bay’, which he recorded in early Dec, but would never get to hear finished following his tragic death in an plane crash on Dec 10th. 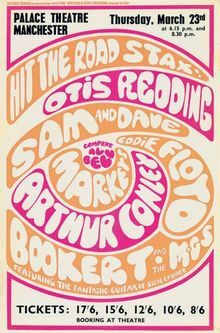 Co-writer Steve Cropper, of Booker T. & The M.G’s (who backed Redding, both on record and live) completed recording ‘Dock Of The Bay’, which went on to sell 4 million copies, becoming Redding’s first #1 and most enduring single following its early 1968 release. 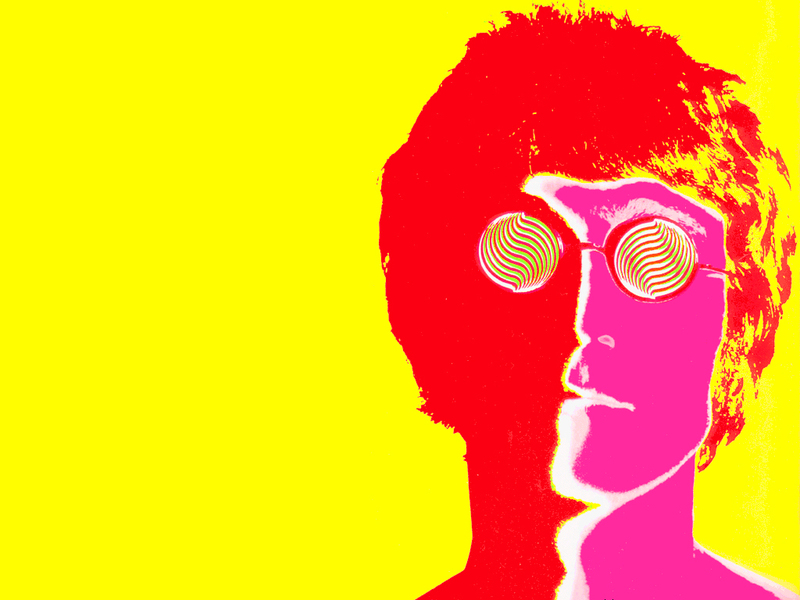 You can look back to ’67 and trace the roots of so many musical directions. Bass music is represented via those early Ska / Reggae hits, whilst Disco / Dance music connects directly back to Soul / R&B, with Tamla Motown, Stax and Atlantic the crucial dancefloor labels, whilst, to underline this, James Brown was busy that year fermenting Funk. Then there’s Rock, flexing its muscles via Jimi Hendrix, Cream, The Who and others. 50 years ago young people in the west genuinely believed they could change the world for the good, and nowhere was this better illustrated than in the remarkable music that broke forth from this ideal. I heard it all around me as a youngster growing up in the ’60s. I didn’t understand what it heralded, but knew it was something almost otherworldly, set against the often grey backdrop of a stiff-upper-lip Britain still reeling from the slow-drip loss of empire. This music exploded into our existence in paisley patterned vibrancy, genuinely adding luminosity and symbolic meaning to so many lives. – there was such a quantum leap at that juncture that, in some respects, we’ve still to catch up with its implications, whilst in other ways we can look back with hindsight at the naivety of the times. But it’s the music of that extraordinary year, forever captured in its vinyl, and now digital amber, which I believe allows our greatest connection to source, enabling an emotional resonance that cuts through time – beyond thought and straight to feel. I get “unavailable in you country” for the mix. In the US. Yes, of course I can see that now Greg. Thanks. I saw the blog post through blurry eyes when I woke up here in Colorado, and pressed play. And just came back to read the blog post after breakfast. As always, keep it Super Weird! Love it…I was born June 1967!!! Wonderful selection of tracks from a standout year.I have long said to friends and family that if I could take a time capsule back in time, it would be to Monterrey pop which was the first of the big festivals.The Californian audience were introduced to Hendrix and The Who for the first time I believe amongst many stellar artists. The vibe and atmosphere was said to be far more relaxed than Woodstock 2 years later when the whole psychedelic/hippy thing was dying fast. Always enjoy reading your posts on music history, I too am a fan of many different genres and met you briefly in Banquet records, Kingston about 18 months ago.